Thanks to my friend/colleague LaKendra Kennedy with Affairs with Elegance for showing this to me. My new favorite thing and works as double duty. A vase and frame! As you may have guessed I love monogrammed things or items you can put your name on. Makes it soo much more personal. 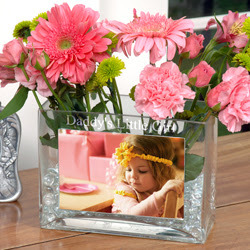 Picture this as centerpieces - add a picture of you and your fiance or use it to put table names. How about you two hold a sign that says '2' for table 2, insert that picture in the vase. Maybe use it as a candy jar and put a sign that says Love is Sweet! This is also a great gift idea for your wedding party or parents - a little token of thanks! Cool Classic Gifts also have a lot of other very cute items to put your personal stamp on! I *love* this. I think your idea of using it as a centrepiece is fantastic. So unique and personal!